Hello newbie here. I used to drum back in my middle school days over 10 years ago and I never really got into it, but now I have had the interest come alive again. I picked up a really good deal on a Pearl Forum series 5 piece drumset and I had a set of Sabian B8 cymbals from back in the day. So I am kind of wondering where to start. The drums I have are almost new, but I'm not getting the sound I want from them. I know the first thing that should go to get better sound is to replace the heads that came with the set to aftermarket heads. For now though I would like to try and just get the best sound out of the current heads, for lack of funds. So what is the best way to tune them and I have seen some people put a pillow or something in the bass drum to give it more of a thump. Is this right? As far as improving skills and endurance I know practice is a must. I got a book with the set, so I am going to look through that. What other suggestions would you have? Thanks in advance. Here is a pic of the set too. Last edited by MagnaRyder02; 09-28-2008 at 08:14 PM. Hi Mag and welcome to our forum. I always recommend starting with a few private lessons with a qualified, professional drum teacher if you can swing it. This can help you avoid picking up bad habits in the beginning. You'll need to know the proper way of sitting, how to hold the drumsticks properly and a few drum rudiments. As you probably already know, there's a lot of free drum instruction on the internet (see my signature line below) but again; it's advisable to start with a teacher to get you on the right track. Other than that, it's all about putting the practice time in. The more you practice, the better you get. Needless to say, there's also a mountain of infomation in this forum. And check out the links at the top of the page (click on "Drum Links") for some other good drum sites. Again, "WELCOME". Kick off your shoes and stay awhile! Last edited by drummer; 09-28-2008 at 08:25 PM. Welcome to Drum Chat Mag! Nice kit! Drummer gave you some really good info. A good place to go is to search the threads here. Just enter a topic and the search will find related threads for you to check out. And there is a bazillion on heads. I have learned a lot here. It is an amazing place to gain knowledge and make some really cool friends. Have fun here. Get some Moon Gel to mute the heads on your kit. These are "OK" drums for the time being and will sound loud. The Gel will help to control the over tones you will get from the heads you use. After that, Drummer gave you the best advice...get with a good teacher and start to fall in love with drumming. drummer gave you many excellent suggestions, but I have a couple of suggestions of my own...Remo makes a muffling ring (called, appropriately enough, Muffl-Os) which could help you on your bass sound. Might also get some info about drum tuning so you can get the best sounds out of your current heads; sometimes a little time spent retuning the heads can make a major difference. Welcome to Drumchat, take off your coat and stay awhile! for the bass drum pillow, i personally dont do this anymore but it takes away some of the sustain and gives it more of a "thump" instead of a "boom"
Welcome to Drum Chat MR, and amen to the throne thought. Since you had some discouragement before, I would say to start there so that you can comfortably play. As to the tuning of the drums, check out Prof. Sound's Drum Tuning Bible (http://home.earthlink.net/~prof.soun...und_DTB_V2.pdf). It will really help you get the hang of tuning in a relatively short time. Once I got the hang of it, I could even get an entry level kit sounding pretty good even with the stock heads. Drum Bum has all sorts of links that can help, including this one, under their tuning links. The icon on the upper right of the page can take you there. You'll also find that there are plenty of threads on tuning lying around here, so make sure to do a search on "tuning" to see what you can find. Well, that's overwhelming enough for now. LOL I started with Drum Chat just as I was beginning my own drumming journey, and it's the best thing I've ever done. This is the most supportive, encouraging, and knowledgeable group of drummers anywhere. Don't hesitate to ask anything MR. The Prof. sound Drumm Tuning bible can teach you the type of kick muffling that is best suited for you style. Great page, really informative. I'd get a throne also. Too bad though I've got three extra ones cause I kept trying different ones until I settled with the ROC-N-SOC. Little expensive but probably the best their is. Might be worth it to save up for one or get a used one. Ok so a throne is def. on my list. Right now I don't have time for drum lessons, while I am at college i don't have much extra time to do that. I have about 30 minutes for practice time at home during the week and work all weekend long. I would be interested if you have any suggestions on things to avoid with form or style. Thanks for the Drum Tuning Bible that looks like a lot of good information I will use that and see how well I can get them tuned. By the way I just noticed on the floor tom that the skin looks a little wavy around 1 edge you can kinda see it in the picture along the left edge. When I go to tune the drum will this go away? Does the layout of the drums look to be good, I can fairly easily get to everything, I just didn't know if there was a better way to lay them out. Thanks. Needless to say, there's also a mountain of infomation in this forum. Yes, well have you hating keytars in no time flat! welcome new drummer guy, not much to add to the responses you have already got, they should do ya for now. 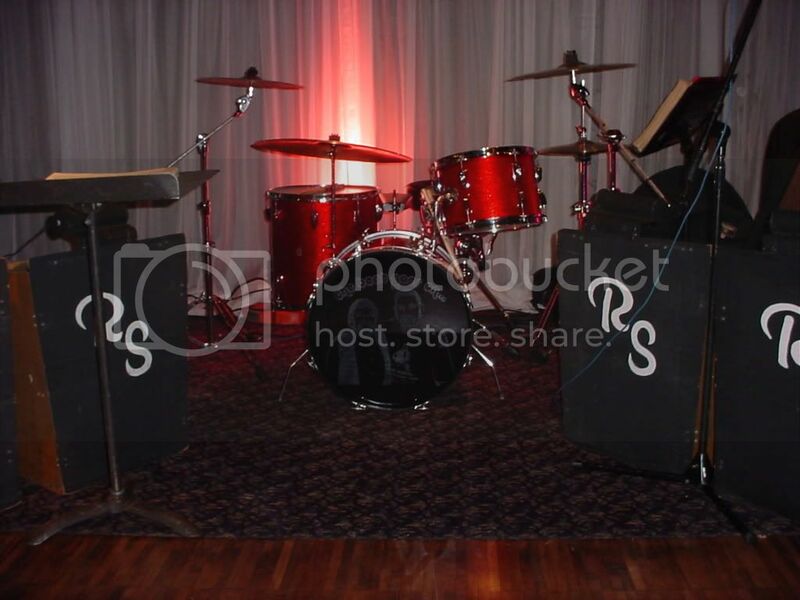 the drum set up looks ok stick around buddy. By the way I just noticed on the floor tom that the skin looks a little wavy around 1 edge you can kinda see it in the picture along the left edge. When I go to tune the drum will this go away? MR, it could be that the lugs are not all evenly tightened. That would leave you with a wrinkle by the loose lug. When you are tuning the heads, you want to put a finger on the middle of the head, and then tap the head about 1"-2" out from each lug to see that the tone is even. The Drum Tuning Bible will explain all that. There are other things it could be, but this is the most usual fix for the problem. As to your practice time, just think of this as a time to blow off steam while you're in college. Even a half hour here and there can help you progress. Get a basic drum book, and just learn the basic rock beat for now. Eighth note beats on the hi-hat, while playing the bass on count 1 & 3, and playing the snare on count 2 & 4. That will help you get the independence. Start slow and keep it even, and then when you start getting it faster while still keeping it even, turn on the radio, and you'll be surprized by the number of rock songs (especially classic rock) that have the basic rock beat. Don't worry about fills. Those will come later. Just get the basic rhythm first. 2. Work on making sure you strike each drum in more or less the same place each time. You will be surprised in the difference in tone you get with ever a inch difference. 4. Good luck and enjoy the ride! Excellent advice Dustin! I'll be taking that myself! Welcome to the forum mag, glad to have you here! Thanks for all the advice, everyone seems so friendly here it is nice. I will try and get a metronome soon. My tempo is really not that bad. Don't laugh, but I have been playing drums on Rock Band (which is part of what got me interested again) I find that this helps me keep a beat going, it has also taught me quite a few different rock beats as I have been able to beat the game on hard. I have been able to transfer these beats over to my set. Welcome, The drum tuning page that Pastor Bob has some great recommendations on getting better sound out of your drums. It sounds like you have limited access to the set during the week, have you considered getting a practice pad you can take with you. Catching a few minutes here and there working on basic rudiments like single and double stroke rolls, and paradiddles, will help build your skills, and it's a great stress reducer.